Come and have some fun, take a deep breath, and have some laughs! We are meeting at the Comedy Cabaret (atop the Poco’s restaurant) on Friday, May 3rd at 9pm. The location is 625 N. Main Street, Doylestown. or our webpage, and click on the ‘donate’ button. 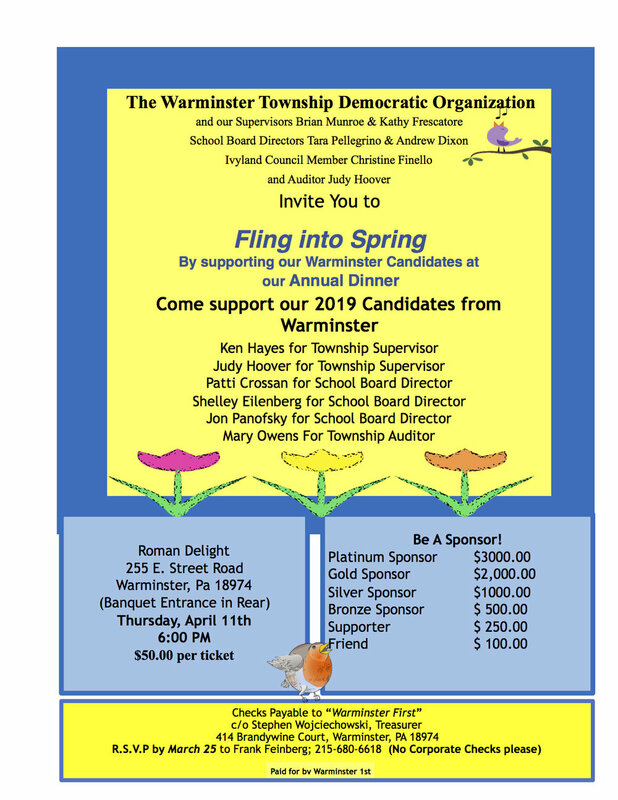 Ticket’s on www.warminsterdemocrats.org are $24/ticket. Tickets at the comedy cabaret are $22.50. Price difference at our website is due to third party processing fees. Tickets are for general admission. Cash bar is available. Register to vote before the November General Election! Just moved to Warminster? Want to change your voter status? The first day to apply for a civilian absentee ballot is September 17, 2018. The last day to apply is October 30, 2018. Join us at the Uncorked Artist’s Warminster Location for a FUNdraiser event where you will celebrate the coming winter by painting “The Feather Tree”. This event is one of our more popular events and tickets go fast! Contact Donna Elms: donna.elms@dixonforpa29.com to volunteer! 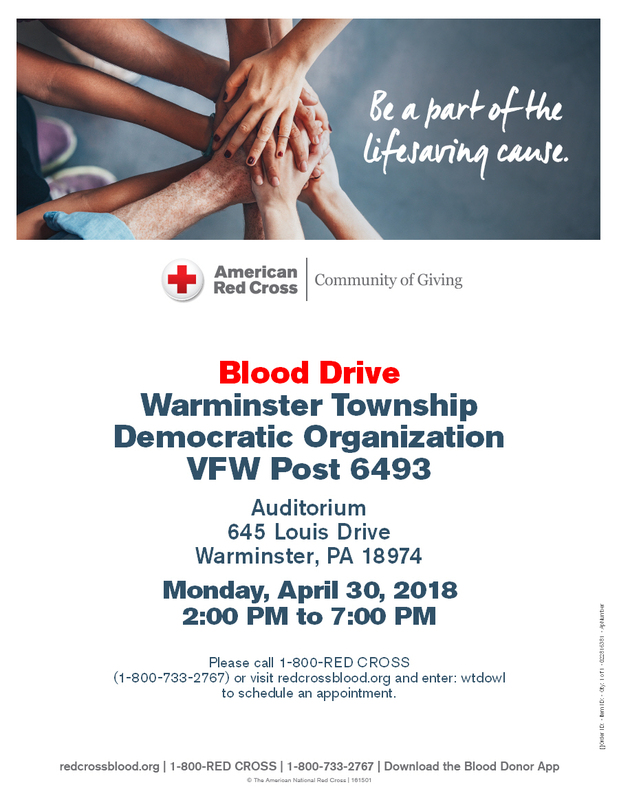 Join us at our monthly meeting and bring nonperishable food items to be donated to the Community Food Pantry in Warminster. All democrats and interested independents are welcome to come on out and attend our monthly democratic meetings. Generally, we meet the first Monday of every month at 7pm at the Warminster VFW. Our August meeting is Monday August 6th, 2018 at 7pm. Get a personal update on Township issues from a Township Supervisor. Listen to Centennial school board updates from a School board director. We also have a Warminster Water Authority, zoning board, planning board updates. Warminster Township is hosting the Warminster Day Celebration on Saturday, June 9, 2018 from 11 AM to 4 PM at the Warminster Community Park. Visit the Warminster Democrats Booth! Meet the candidates: Maria Collett for State Senate, Andrew Dixon for State Representative, and Scott Wallace for Congress. We will also have Patriotic Pinwheel Giveaways, Voter Registration Applications (English and Spanish), Absentee Ballot Applications, and your township Democratic information. Free Parking & MORE ! Bring your family and friends to this event – showcase your business, interact with potential clients, or just have fun! Contact the Parks & Recreation Department with questions at (215) 443-5428. Make your plans to come out and VOTE in this years Primary! Join us in supporting the American Red Cross and honoring a past member, Herb Utain. Come on out and enjoy a great time with friends, neigbors and like minded Democrats! We are holding our annual Warminster Democratic Dinner at Roman Delight in Warminster. The dinner is Thursday, April 12th 2018 at 6pm. Roman Delight is located at 255 E. Street Rd in Warminster. $50 ticket gets you full buffet dinner, which includes appetizer, salads, a choice of 3 entrées, desserts, coffee, tea, cash bar available. Click on the red (Donate) button on our website and select the applicable option. 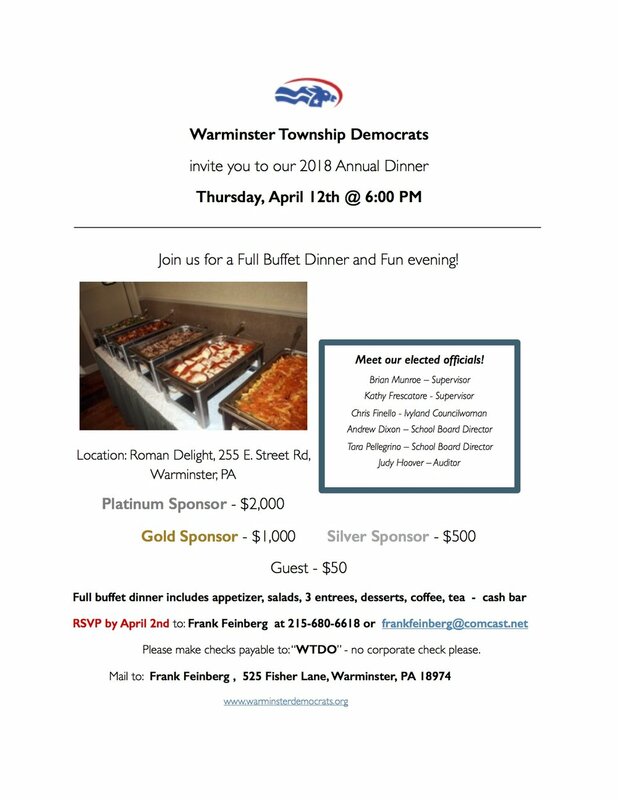 Join the Warminster Township Democratic Organization for a FREE event! The Democratic Organizations of Ivyland, Buckingham, Northampton, Upper Southampton, Warminster, Warrington and Warwick will be hosting up and coming Democratic Candidates Scott Wallace, Steve Bacher and Rachel Reddick for Congress and Maria Collett for State Senator during the WTDO February Membership Meeting. Come find out more about the candidates and meet other local Democrats. This is a great opportunity to bring your questions directly to the candidates. Make your voices heard and send a message by coming out to the polls on Tuesday November 7th! VOTE! Vote for a Fresh Start here in Warminster! Click here for information on our Fresh Start Democratic candidates. Click here to find your voting districts and polling location. See you Tuesday November 7th! I am excited to announce our annual Uncorked Artist event! On Thursday, October 5th come out and enjoy wine, beer, snacks, desserts, and great company all while painting your next favorite fall decoration. This event is always well attended and tickets do go fast and is open to the public. Wine, beer, snacks, and desserts are supplied by the WTDO. Paint, brushes, and all other supplies are provided by the Uncorked Artist. .Looking forward to see you at this fun event on October 5th! The Warminster Democrat's monthly meetings are typically the first Monday of every month. However, this month was scheduled for Wednesday, September 6 at 7pm due to labor day. Come on out to the Warminster VFW located at 645 Louis Dr. Weather you have come to 20 meetings or are thinking about coming to your first, all are welcome! Parking is around back and enter through the rear door. Hearing being held at the Rachel Carson, State Office Building in Harrisburg, PA. Tracy Carlucci, Deputy Director of Delaware Riverkeeper Network, will be speaking on their petition to lower the accepted levels of PFOA/C's to a regulated level of 1-6ppt. The current unregulated standard is 70ppt. The importance of having residents in the room will be to demonstrate that this is a vital issue for people in the affected region and there is public support for the state to set a standard to mandate its removal from our water. The DEP will make a report and give their opinion about what the Pennsylvania Environmental Quality Board (PEQB) should do. The petition will be discussed and voted on at the meeting - if they decide to move ahead with the concept, they will approve it. Warminster Democrat's typically meet the first Monday of every month. Meeting place is the Warminster VFW, located at 645 Louis Dr. Parking is around back, enter in the rear door. Last day to register to vote for the May 16th Primary! If you are not registered or wish to change from third party to Democrat, your last day to register to vote in this very important May 16th Primary is Monday April 17th 2017. Please click on this link to change your registration or to register for the first time. Remember, there is no greater impact on your daily lives than your local government or local School board. Please come out to vote on May 16th! Enjoy a full Buffet dinner, music and cash bar while talking with Township Supervisors Brian Munroe and Kathy Frescatore. Also, meet our full slate of candidates! Anna Peak for Township Supervisor, Andrew Dixon, Shelley Eilenberg, Tara Pellegrino for school Board, Dan Finello for District Judge, Pat Boyle for Tax collector, and Judy Hoover for Auditor! To Purchase tickets online, you can do two of the following. Click on this link and it will take you to the direct purchase page. or go to www.warminsterdemocrats.org and click donate.